To serve God and His Church by carrying His Word in our hearts, proclaiming it to His people and living it in our everyday lives. The Lectors’ Society of the parish of St. Francis Xavier was formed in 1983. 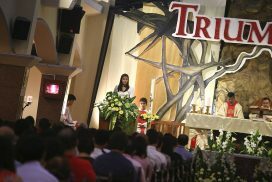 Prior to that, members of the congregation attending that Sunday Mass were called upon to proclaim the Word of God. They were usually invited to do so, by either the celebrant or wardens, as they entered the church for Mass. Needless to say, there was little time for preparation or to reflect on the scripture passages to be proclaimed. Lectors are not mere reciters or readers. They are an essential part of the liturgical ministry, called to proclaim the Word of God to the assembly. Most of us would admit, however, that we did not realise we were “called” when we decided to become lectors. We simply felt we wanted to serve in the parish and if we had a reasonably good voice and reading skills, the Lectors ministry seemed most suitable. It is only through participating in the bible reflections and sharing, which are an integral part of our monthly meetings, as well as private time spent in prayer and practice, that we make the transition from reader to proclaimer. Even those of us who have been lectors for many years find that we are unable to effectively proclaim the Word of God, if we have not spent time in prayer and reflection before Mass. The Lectors’ Society meets once a month (usually on the 4thThursday of every month). Members are required to make this commitment. Given the importance of God’s Word in our ministry, meetings begin with the enthronement of the Bible, followed by a reflection and sharing on a Scripture passage. Time is also allocated for members to work on the pronunciation of difficult words and for feedback to be provided with a view to improving our proclamation skills. The rest of the time is spent discussing upcoming parish activities, attending to administrative matters and enjoying fellowship over refreshments. In 2001, a group of “Young Lectors” was formed to provide the youth of the parish the opportunity to deepen their faith through an appreciation for the Word of God. Guided by an experienced Lector, this small but dedicated group meets one Sunday a month.